Recently I sat down via the Internet to discuss with Anthony Iannarino the issue of prospecting and, more specifically, some of the myths that keep people from doing it. I reached out to Anthony, because not only do I value his opinion, but I also wanted to talk about his new book (which I strongly believe you need to buy). At the bottom of this post is a special link you can use. Too many salespeople allow themselves to be victims of underperformance solely because they fail to prospect the way they know they should. There are so many “myths of prospecting,” including thinking if you take care of your existing customers well enough, they will refer enough business. Excuse me, but relying on referrals from existing customers simply is not going to feed your family. Another myth is the belief that because you’ve been successful up to now without having to prospect, there’s no reason to start now. Wow! Another stupid belief! It’s myths like these and my desire to show people how to prospect effectively that compelled me to write High-Profit Prospecting. Yes, you need to buy it! Here is the link. OK, I said my friend Anthony has a new book, and he is offering a deal that is quite good! Here is the link for that special offer. His book, The Only Sales Guide You’ll Ever Need, is just that — the only sales guide you’ll need! 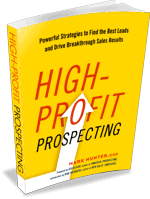 Assuming you already own High Profit Prospecting!